Published December 17, 2018 By Anna J. This post may contain affiliate links. Regardless, I only recommend sites I've researched and/or used and trust. 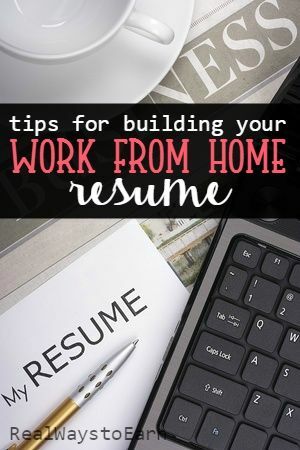 If you're looking to create your work from home resume for 2019, we have tons of tips for you today! I love any topic that relates to the job hunt. It is, after all, called a “hunt” for a reason – the process of finding the right fit by sorting through job boards is akin to an ancient hunter pushing back palm fronds in a jungle – or at least, it is to me. It’s almost romantic, and perhaps that’s why I fell in love with it, and with helping folks find the right career fit for them; it’s why I incorporated it into the writing and coaching work I do as well. I think in this day and age, you can’t afford to not be a hustler, even if you’re seeking a typical 9-to-5 type of role. Applying for jobs is a job within itself (especially if the company you’re applying for makes you rewrite your resume through their job portal, ugh! Why do companies still do this?! ), in that you not only have to dedicate time and energy into looking for work, but you also have to do it in the right way; applying for jobs randomly is a waste of a company’s time and your own time. The process of finding a job can be an overwhelming one certainly, but it doesn’t have to be. There are a few strategies you can employ (pun intended), specifically within writing your resume that will help companies pick up on your skillset over others’. What can be doubly tricky is when you’re primarily a remote worker, and need a resume that reflects as such. Don’t despair – you can get part-time, temporary, or even full-time work either as a contractor or employee, and you can do it from the comfort of your home! All it takes is some know-how in formatting a resume to show off your abilities. One of the most important things I tell my clients to keep in mind is that even small companies and startups use recruiting software and applicant-tracking systems like Greenhouse, to name one very common example. This means that when you submit a resume through a company website or job board, it gets filtered through this AI (artificial intelligence), which in turn picks apart your resume and/or cover letter for keywords that match the job description. In order to buck this system, carefully look through the job description and pick out keywords, orwords that stick out to you; for example, if you’re applying to be a work-from-home content writer, you may want to highlight your experience in working with SEO, social media, A/B testing on Facebook, etc. If it’s editorial work you're looking to get, make sure to include your KPI’s, or Key Performance Indicators in your work from home resume; for example, if you wrote some articles for The Huffington Post, be sure to include in your resume that HuffPo has 119 million website visits. If you write for a client who uses Medium (or a similar company) as a publishing platform, you can get your article stats directly from there as well – or just ask your editor! It never hurts, in this case, to know your numbers. Even if it’s just a sole proprietorship, it’s going to make so much more sense to your future employers if they see your client work in neat bullet points under the heading of a company name on your work from home resume! For example, on my resume, I have it formatted to state that I am the owner of Girl.Copy, and have been “working there” from 2015 – present (even though I’ve been a professional writer for over 12 years). My bullet points underneath that header are straight-to-the-point: I list out the clients I’ve written for, as well as my own business development work (i.e., I do all of my own cold reachouts and networking), social media marketing work, etc. Having your own business puts all of your freelance work into a neat box that you can wrap up with a pretty bow, even if you weren’t technically paid through your DBA (Doing Business As) name – you’re still a freelancer, and your client is still paying you, as a freelancer, to get the job done! When formatting your resume like this, you’re also writing in the language that the hiring manager speaks – it makes sense to them, so they’re more likely to take you seriously. Unfortunately, sometimes freelancers can get bad reputations, so you want to present yourself as responsible and reliable as possible. I still keep my resumes – and my client resumes – in a bullet-point format. It’s easier for hiring managers and recruiters to read, and tricks the eye into thinking it’s easily digestible, bite-size information. I actually do the same for LinkedIn job descriptions, only I use more interesting-looking bullets while the platform is still so simple, like plus signs as opposed to rounded bullets. LinkedIn also has the capability to neatly showcase under one company name the timeline of your promotion(s), which is extremely helpful for hiring managers. Ideally, if you’re an employee at a company and not an independent contractor, you should be getting promotions every two years; if not, it’s time to move on. According to The Balance, “each bullet point should include a concise phrase or sentence that begins with an action word” – so, use words like, “managed,” “employed,” “took,” “presented,” “hired,” etc. Networking + a New Resume = Success! Whenever I apply for a freelance remote writing gig, I look up the decision-maker on LinkedIn. Even if that information isn’t available on the company website, or you have no idea where to start, you can add connections from that company based off of this main question: who are the money people? Meaning, who are the people looking at the bottom line and deciding if it’s worth it to hire you? While they may not be the direct decision-maker(s), they do control revenue, so connect with Chief Financial Officers (CFO’s), Chief Operating Officers (COO’s), Chief Marketing Officers (CMO’s), Chief Content Officers (CCO’s), Senior Vice Presidents (SVP’s), etc. And try to connect with HR people as well – they’ll usually accept your connection no matter what (unless you have a dud of a LinkedIn profile! Remember, your LinkedIn is your virtual resume, so as you reformat your copy that you’ll send off to companies, reformat your LinkedIn along with it), as hiring someone with whom they have a personal relationship with is much more attractive than posting a generalized job ad on a job board. That said, make sure to nurture those LinkedIn relationships! Send follow-up emails after applying for a job to these decision-makers, even just to see if they’ll hop on a quick 10 minute call with you. Their answer may be no, but they’ll remember your follow-up and initiative for the future. The Balance – this is a great website with a ton of resources for those just starting out and seasoned entrepreneurs. Knock ‘Em Dead Resumes – this is an e-book with some AWESOME reviews! It also includes tips on acing interviews. Purdue OWL – Provides resources to help you write successful resumes and CV’s for your job search. My Perfect Resume – Build your resume with the provided templates. Even more resume templates are available to help guide you on your resume-writing path! If you’re a freelancer, write a skills-based resume. Check out this article on The Muse for more info on how to do so! Always include your relevant education, scholarships, certifications, and study abroad trips. Otherwise, you do run the risk of getting your res thrown in the trash! And you don’t have to include your GPA, unless it’s near-perfect or perfect. Change up your resume based on a job description’s keywords. I cannot express enough how important this is! You should be changing your resume for every job you apply for. Follow the rules. Look up “traditional” resume-writing rules, i.e., don’t write in the first person, don’t choose a resume template that’s too aesthetically-distracting, etc. Don’t downplay those KPI’s. If you can quantify your achievements, do it – write that you increased sales at XYZ Company by 25% in Q4, and I guarantee the hiring manager will be impressed with your resume-writing savvy. Give ‘em your digital footprint. Include links to your online portfolio/website, LinkedIn or Behance profiles, etc. – whatever you have online that’s professional, find a way to give it to ‘em. Don’t be boring. Are you obsessed with your favorite sports time or manage an Etsy store in your spare time? These days, having a side hustle or hobby is interesting and impressive to employers – it showcases an “entrepreneurial spirit,” and helps them see you as a person, not just a name on a white page. If you just don't think you can create the kind of resume you need on your own, have a professional do it! Leisa Good, a virtual assistant and regular contributor here at Real Ways to Earn, does resume and CV writing, along with career coaching. You can go here to get started with Leisa. Another Idea – Do You Want To Get Paid To Write Resumes Yourself? Did you know that you can also work at home as a resume writer? You can do this either through your own business where you seek out private clients and set your own rates, or you can opt to work at home for a resume company that regularly needs writers (such as Talent, Inc). Learn more about working at home as a resume writer. We wish you good luck no matter which path you choose! Post originally published December 10, 2010. Updated and re-published on December 17, 2018. Thanks for the tips. I am a retiree interested in finding part or full time, remote employment. Remote refers to a “work at home” position. My first step is to rewrite my resume so that I will be seen as a person that companies would view as someone to speak with, a strong candidate. While I have had a successful career in which my resumes have led to interviews and professional employment, I am a bit of a duck out of water in writing a resume with the objective of finding part or full time remote employment. Your article that I have just completed is step one in my efforts to meet my goal of remote employment. Thank you for the tips and suggestions. My journey toward reaching my goal continues!